Something you might not be aware of is that Gardinia has a trade counter that stocks many 1000’s of Upvc Window & Door repair parts, called Upvc Spares 4 Repairs. In addition as Upvc Spares 4 Repairs we have been selling online for over a decade now, having shipped orders to all corners of the world, including New Zealand, the Falkland Islands, Alaska and Japan. Sometimes we have wondered if it wouldn’t be more cost effective for our international customers to buy locally, as shipping certain items we sell to the other side of the world can be quite expensive, even with our competitive shipping rates. 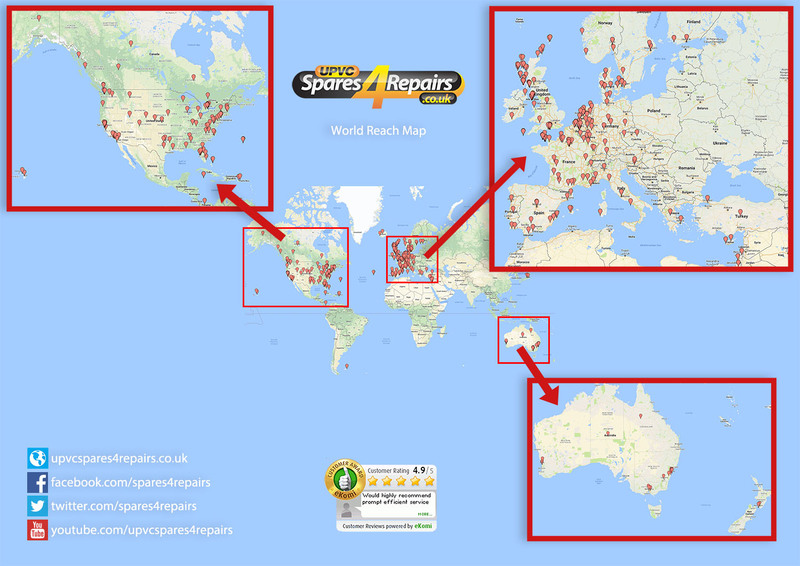 However on many occasions our international customers have informed us that Upvc Spares 4 Repairs are the only company on the internet selling the particular part they were looking for. With that in mind we’re quite proud of all the countries we have shipped to over the years, we have created a World Reach Map showing all the international locations we’ve shipped an order to. Some destinations such as America and places in Europe we can often have multiple orders dispatching to daily. If you’re local to the Huddersfield area you can visit our trade counter from 8:00am to 4:30pm Monday to Friday, to the rear of the Gardinia premises on Leeds Road, our complete product range on the Spares 4 Repairs website is available to purchase in store. This is something local tradesman have found an invaluable resource over the years. We have also filmed many Spares4Repairs YouTube Video Tutorials to hopefully give the keen DIYer the confidence to purchase a repair part and undertake the repair themselves. Of course Gardinia also has a dedicated service engineer looking after the Huddersfield area so if you’re local to us we can take care of you either way, regardless of if your Windows or Doors were installed by Gardinia or not, we’re happy to service existing Windows and Doors where possible. Why not have a browse of our Upvc Spares 4 Repairs site today? One of our best selling products at the moment is the Patlock, which was featured on our blog post last week. You might have also seen the advert featuring Frank Burno on TV recently! If its Multipoint Door Mechanisms, Upvc Door Handles, Window Hinges, Euro Cylinder locks, Keeps and more, our Upvc Spares 4 Repairs team can help.